The Ambassadeur 2500c has been Hot Rodded! JDM line to round things out! This morning I was up early. The coffee was hot. The house was quiet. Time to take the plunge and upgrade the 2500c. It wasn't as hard as I thought it was going to be. In the first picture you can see the new spool (5.8g), and the new magnetic braking system. What you can't see in the new 4 prong centrifugal system that replaced the original 2 prong. In the second picture you can see the new ultra light level winder. The third picture shows the new single handle that I bought from Texas. I prefer a single handle, but I'm not sure this is going to be the one I really want. The last picture is the line I am going to try first. I have a second spool that weighs 7 grams. I should have ordered two of the 4 prong brakes, so then with the simple removal of one side plate, I could have a two line setup. 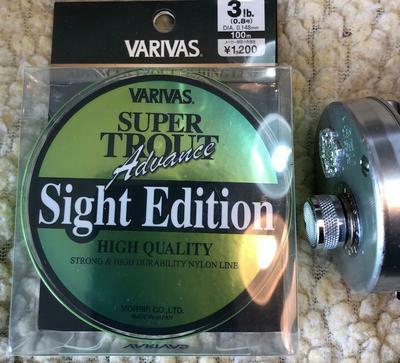 So, tonight I will put it on my Tenyru Spectra spinning reel and give it the test. Just didn't have time this morning. My first impressions - Wow! From just playing around, I can tell it is much more of a finesse reel than in the original format! It is amazingly smooth! The spool spins forever! More to come in updates. It isn't my father's Ambassadeur anymore! Comments for The Ambassadeur 2500c has been Hot Rodded! Very sweet build, I’m really liking these round reels. Les, very nicely done. Couple of questions tho. Did they make the 2500 in a left hand reel? Also is that thumb bar the string release or do you have to push down on the knob on right? Also curious how much you have spent on the reel so far. Kelly- Yes they make the 2500 in a Left Handed version it is the 2501, good luck on trying to find one as they are super rare and when they come available the prices reflect that they are a unicorn. Few months ago a tuned 2501 sold on Yahoo Japans Auction site for around $2000 USD. I’ve had my eye out for a while for one, though if you want a round reel I’d highly look at the Calcutta Conquest BFS I recently got the chance to play with one and it is on the list of wants. Kelly - I have just shy of $300.00 invested in parts and a total refurbishment by an Abu expert. If the reel didn't have sentimental value and was inherited, I'm not sure I would have done the build. There is a guy on YouTube who has tuned a Shimano Aldebaran BFS XG to cast a 1 gram lure consistently over 50 feet with accuracy. After the build, the premium reels don't look that out of line (pun intended) anymore. Now to go out and see how it casts! Have seen that video on YouTube, Les but now he's got almost $600 in that reel. Quite frankly, I'm having a hard time swallowing $400.00 for a baitcaster when I already have any number of less than $100 spinning reels that easily cast 1 gram lures and I don't have to learn something new. But then NEW is a challenge and when I'm six feet under that money saved won't do me any good. Woke up to it snowing outside so am in a bad mood-sorry guys, this ice and snow is getting very old here North of the Wall(pun intended)! Can't even go outside to play cast, urgh! I put on a 2.5 gram Crusader spoon and mounted the 2500c on the Tenyru Spectra spinning rod. The first cast was awesome! Lifted the thumb off the spool a hair late, but it was a nice 10 yard cast on the front lawn. The next two cast were great too! Then the over confident 6 year old in me took over, and it was time to go for distance! Oh, it was a classic rat's nest! H'm, I heard my grandfather voice in my head, saying, "No you can't cut the line, just work on pulling it out." So, I did. Then the experimenting began. Side casts were no problem. Getting an overhead cast that didn't overrun was difficult unless I really dialed in the brake. So, there will be a learning curve. Bottom line? I am very happy with the reel. It is working beyond my expectations. Two rat's nests that were my own fault for being over confident and overpowering. This is finesse fishing! I was able to cast a .9 gram spoon about 8 yards with no problem as well. Looking forward to the learning curve. Although some spinfishermen and baitcasters may turn up their nose at an 8 yard cast, tenkara anglers know you can catch fish all day long and never cast even as far as 8 yards. Kelly - there are a few cheaper options out there by a few manufacturers. The Daiwa Air Stream Custom is a nice reel, I’ve used a few others as well that are solid contenders. As for a reel it is an investment in my fishing and I’ve had to try several reels to find what feels best for me. I don't like the new handle on the 2500c. The way the clutch works, I prefer a double handle. The original handle is bent from when my dad had it. So, I just invested another $120.00 in the reel. I also bought another 4 prong brake for the second ultra-light spool that I bought. As well as it worked yesterday, I hadn't totally put it back together right. Those Japanese translated instructions are not the easiest to decipher sometimes. Now my double brake is working too good! I may go down to two magnets instead of 4 or just take my double brake system down to one. Time to play! Time to get the rod done! So anyway you look at it, I could have bought either of the new Diawa reels from Chris and been ahead. However, I wouldn't have a 2500c! Hopefully, I can get it really dialed in. The jury is still out. Getting everything right in the reel makes a difference! The reality is I need to take two magnets out of the magnetic part of my braking system. I was getting consistent good casts just before going to work. Two overhead casts, no over -spooling resulting in disaster this morning. I wasn't getting the distance, but 20 yards with a 2.5 gram spoon is OK. I just know it will do better with two less magnets in there! All the votes are not in yet, but it is a majority that this is a winner! 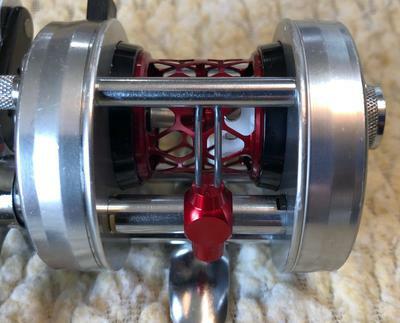 Chris or others on the forum - Do you know of any good tuning videos for casting reels? I don't know of any. Les - what in particular are you looking for on the tuning side? I did find the answer to my questions, as I watched a guy on YouTube testing some Chinese reels. Having the ability to either use magnetic or centrifugal braking was overloading my simplistic brain! I am planning on dropping down to 2 magnets and see how that goes. I also learned that setting the centrifugal drag as strong as you can for the distance you want is best. I've also realized, (that inner 6 year-old gets me in trouble) I don't have to cast across the river or lake! A reasonable distance is all that I need. 15 to 25 yards is plenty for max distance for stream finesse fishing. I'm not content with the performance of my rebuilt reel yet. So........more parts ordered! I'm learning the hard way that sometimes you only get part of what you need to make things work from Japan! For example the place I bought my new 4 prong brake doesn't have the brake blocks! I was wondering how it would work without the blocks. So the reality is I have only a magnetic brake right now. I had to order a spring and pinion bushing for my spare spool from a different company too. Yesterday after an email from a friend who just bought a hot-rodded Abu reel from Japan, I was exhausted just trying to wrap my head around all the modifications that were done to hot-rod it. The Shimano Aldebaran BFS is looking more and more like a bargain! Ah, Angler Saito did me in! I got caught up in the hype! His videos are professionally done and edited! I jumped into my project without really thinking things through. That isn't his fault. Jesus said, "For which of you, intending to build a tower, does not sit down first and count the cost, whether he has enough to finish it?" That is ME! It takes way more to turn an Abu Garcia Ambassadeur 2500c into a bona fide Bait Finesse Reel than I thought. The stock bearings are not going to cut it. So, another order to Japan for upgraded ceramic air bearings! I have been doing my research, post jumping in to this build. There are two guys on YouTube who are into bait finesse. Both of them have high praise for the reels that are carried on this website. One of the guys did modify a Shimano Aldebaran BFS XG with an aftermarket Avail spool and magnet kit, and achieved amazingly long casts with a 1 gram lure! It seems the Aldebaran is possibly the best all around Bait Finesse reel. The Daiwa reels really shine with the lighter lures. The good news is I sold one of my Sage - Able fly outfits, so I do have the bucks to finish the 2500c. If I had counted the cost first, would I have done it? YES. I'm going to have a very special reel. However, I would have done things much differently. Instead of just throwing parts on it, I would have put together a plan. After enjoying a weekend with my balanced JDM spinning outfit, I realized a nicely balanced casting outfit from Finesse-Fishing would have gotten me off to a much nicer start to my new adventure. Thank you Chris for doing proper research! Sorry, I didn't pay closer attention! 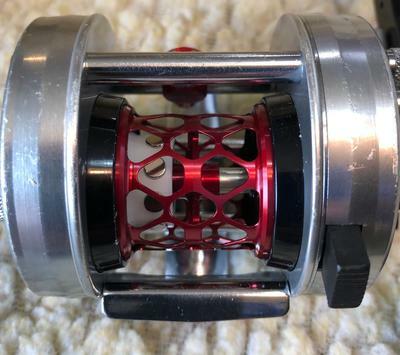 A Daiwa Alphas Air Stream Custom 7.2R and a Shimano Trout One NS (Native Special) B50UL would have gotten me off to the right start for less than I have in my customized reel. Yeah there is a definite art in modding the reels. So many options just trying to figure out the best options.